We received a wonderful gift a day early on Christmas Eve - a beautiful cold, clear, windless winter day to climb 4,083-foot Camel's Hump in the Green Mountains of Vermont. Up to six inches of snow fell the day before, coating the trails, trees, and rocks with soft powdery snow. Simply beautiful to be outside on such a day. This was our first climb of Camel's Hump in any season. We chose a 5.8-mile loop, much preferring that to an out and back on the same trail. We were prepared for ice, strapping on microspikes to the bottom of our boots soon after we started. At 7:45 am we were the first to arrive at the well-maintained and freshly plowed and sanded parking lot. Temperature 5 degrees. As we prepared to start our hike another car arrived with Lulu, a Kodi-like canine, and her human companion. They were going a different way so we never saw them again, nor anyone else all morning until we started our descent at 12:30 from the top of Camel's Hump. All morning we shared the woods with just the animals: snowshoe hare, grouse, and weasel tracks; the sweet tweets of kinglets and chickadees; a flock of cedar waxwings eating mountain ash berries. The morning sun caught the tops of the trees overhead just as we started north on the Long Trail. Our route took us in a counterclockwise direction via the Connector Trail to the Forest City Trail to the Long Trail, then back on the Burrows Trail. The trail guide said this route takes about 4 hours in summer. We took 6 hours. The trail was new to us and the fresh snow covered ice underfoot and obscured the best foot and hand holds. Just as we started north on the Long Trail toward the summit of Camel's Hump, we passed a sign that warned about the trail ahead. It said the trail can be difficult to follow in winter. We encountered several challenging spots: ice covered rocks that we had to scale, a narrow canyon slot to get across with Kodi, a high ledge that we climbed up and over, a narrow ledge that we inched around while hugging the rock face, and the final ascent above treeline. Yet, it was a beautiful route with spectacular views and offered challenges that we studied and overcame and pressed on to the top, exhilarated by the hike and the views. The views to the south and east as we climbed the Long Trail were especially spectacular. The first 1.3 miles of our hike (the Connector Trail and the Forest City Trail) took us 1 hour and 20 minutes to hike. The next 1.9 miles to the summit took 3 hours, because of trail conditions. The slow pace was worth ever step as the blue sky, white winter wonderland, crisp air, and lack of wind made for an amazing day of hiking. The final 0.2 miles to the summit held a final few challenges for us before we finally reached the top. And then we reached the top. The 360 degree view from the bare (camel's hump) summit was awesome and such a day. We looked north to Mt. Mansfield, the tallest mountain in Vermont. We looked east to the White Mountains in New Hampshire, The High Presidentials and the Franconia Ridge clear in the crisp air. We looked south along the Long Trail to Mt. Ellen in the distance, while the view west across Lake Champlain to the Adirondacks was the only view obscured by clouds. We took in the final views near and far as we began our descent. As we descended we finally started meeting people coming up the Burrows Trail - a much easier, but far less interesting route. All day ice crystals floated in the air, glittering before our eyes. What a gift this day was. To all a Merry Christmas. Forty-one degrees. Our headlamps pierce the early morning fog. A bright sliver of the waning moon wraps its crescent shape around the darkened, old moon low in the southern sky. Today is the first day of winter, although it feels and smells like the first day of spring. On the way to the store to buy two grapefruits at mid-morning (it feels like grapefruit weather) for my nieces' Christmas basket, I flushed a turkey vulture from a road-killed gray squirrel. It was not so many years ago that vultures did not occur in northern New England even during summer months. Now they are nearly year-round - maybe this year some with stay if they find the weather favorable. Fears of climate change creep back into my thoughts. The animals fear not; they move and migrate and evolve, although the pace of change may outrun their capacities to adapt. Tuesday morning with a temperature of 12 degrees felt more like the first day of winter. Yesterday a warm rain fell most of the day, giving a feel of the first day of fall. Today, spring-like. On Tuesday ice crystals sparkled on the frosty ground. Today, the woods sparkled with rain drops. Yesterday morning the thermometer read 12.5 degrees. Cold enough to wear long underwear on our predawn walk with Kodi. Our headlamps lit up the frost-coated leaves and grasses, the ice particles sparkled like diamonds in the early morning darkness. Stars sparkled in the windless, clear air. Cassiopeia low in the northern sky, the Big Dipper overhead. The waning crescent moon in the southern sky. No sounds except for our own breaths in the cold air. In the cold morning the ground felt hard and crunchy from tiny frost heaves. As the day warmed the ground thawed again. By nightfall the temperature had risen to 40 degrees. By the calendar winter arrives on Thursday. It has been slow in coming. I never tire of seeing signs of beaver. This clever and hard working large rodent is perfectly suited to its life in water and on land. Beaver are busiest at night, fixing their lodge, repairing the dam, making and marking scent mounds on shore, and gnawing down trees for construction projects and for food. Several of my regular local haunts that I visit with Kodi lead past ponds or river oxbows occupied by beavers. At one such place this week I discovered a new lodge built among a fallen red maple tree near the shore of a river oxbow. The lodge is built of sticks and packed with lots of mud. Beavers dive down to the bottom of the river or pond to dig up soft mud, clasping it to their chest as they swim back up to the lodge. The well-built lodge includes an inner chamber about 2 feet high and 6 feet or more wide, that is built above water level. It is big enough for the family - typically the parents, two to three young of the year, and two 1-year old offspring. Sometimes the 2-years old stick around, but usually they disperse in the spring to set-up their own territory upstream. The lodge has a vent in the top to allow air exchange in winter. In fall the beaver family begins caching food - branches of favorite foods -- near their lodge. When the water freezes over in winter, they can reach the stored branches from underwater, slipping out of their underwater lodge entrance for a meal. In the photo above you can see the extensive stash of hardwood branches next to the lodge. In summer they much prefer aquatic plants such as the tubers of water lilies. Beaver have so many cool features and adaptations, enabling their unique lifestyle. Their large skull supports 4 sharp incisors that grow continuously. These teeth make the marks so distinct on beaver-chewed trees and branches. They use their flat, scaly tail for balance (when gnawing trees), as a rudder while swimming, for warning (the familiar water slap), as a fat reserve (for winter), and for heat exchange. Beavers have several features that allow underwater activity: valves that close off the nose and ears, lips that close behind their teeth so they can feed and carry sticks underwater, features in the back of the mouth that prevent water going down their throat, and a nictitating membrane that protects the eyes. Beavers can spend 5 or 6 minutes underwater. The beaver's hand-like front feet help them dig and grasp things. Their webbed hind feet provide the obvious aid to swimming and to walk on land, if awkwardly. One of the hind toes is split and is used to groom their thick fur. Some beavers live along the shores of or in the banks of large water bodies and don't need to build a dam since the water level is naturally deep enough. In smaller water bodies they build a dam to flood an area deep enough to allow underwater winter entrance to their lodge and to reach preferred food supplies. Beaver also build small canals to reach food supplies, floating logs and branches back to the lodge or dam as needed. 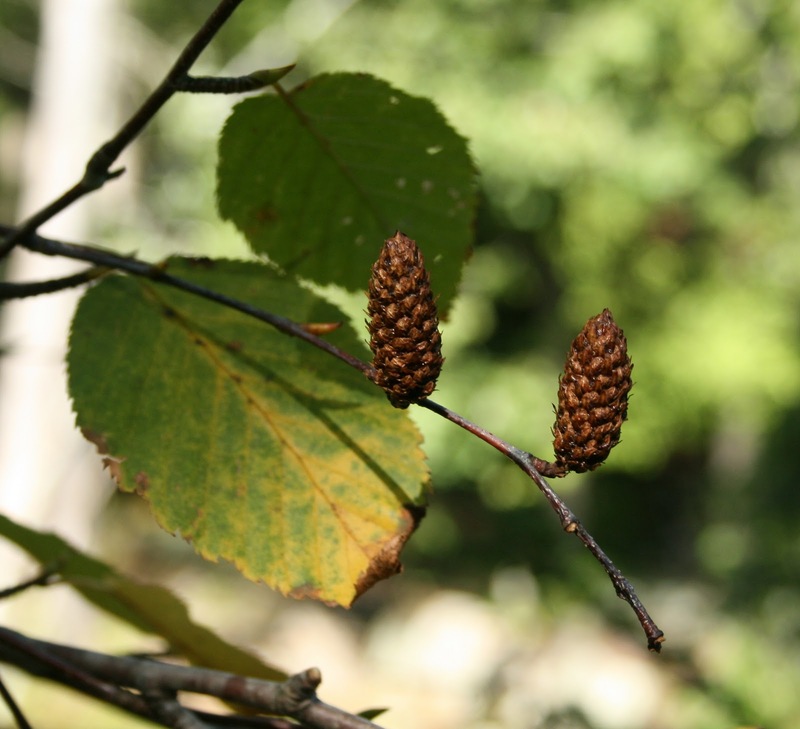 Their favorite all-time foods are aspen and willow, but they will take other hardwoods and sometimes pine or hemlock. Interestingly, red maple is not a favorite food, it is difficult for them to digest. Sometimes a beaver fails to drop a tree in the right direction and it gets hung up. I've read nothing to indicate that they can judge which way a tree will fall. One study said that European beavers hang up trees about 15% of the time. That's not bad. You do wonder what the beaver thinks when they make the final gnaw, the tree begins to fall, but then hangs up. It probably gnashes it teeth. Here is one of those hung up trees. Although not to be deterred, the beaver moves on to the next tree night after night. I've been thinking about wild things lately, in particular wild boar. This was prompted, in part, by a recent article in New Hampshire Fish and Game Department's Wildlife Journal. Soon after I became the wildlife specialist at the University of New Hampshire Cooperative Extension in 1993, I visited several well-known large landowners. That was my job at the time, to educate and assist landowners in managing their land for wildlife. One of the first places was a 24,000-acre private hunting preserve in southwest New Hampshire known as Corbin Park. I was taken aback by this place for several reasons. First, I am not keen on private hunting preserves. Second, this preserve was open only to men, so I was told, and it cost a fortune to be a member. Corbin, the guy who founded the place in 1890, was a rich banker. If a member died, I was told that his wife would have to sell the membership. This was in 1994! Corbin Park is surrounded by 20 miles of high fence, both to keep humans out and animals in. Exotic animals were imported to the Park and fed at various feeding stations, around which members could come with friends to shoot these animals. Perhaps there was some rule that the animals could not be shot when they are feeding, but I'm not sure if that was true. One of the imports was Eurasian wild boar. The 1938 hurricane blew down a lot of trees in the Northeast and apparently also knocked down a lot of the fence around Corbin Park. Picture Jurassic Park. The animals escaped. The fence went back up and things continued on as they were. When I visited in the early 1990s I saw some of the fence. The fence naturally crossed all manner of terrain including small streams. A fence across a stream leaves an opening. Any self-respecting wild hog could get through such a hole. I was bewildered by the entire set-up. As I recall I was not particularly welcomed at Corbin Park. They were not much interested in my suggestions for managing native species and natural habitats, let alone for biological diversity. I never returned. The title of the article in the Wildlife Journal is, Don't Let New Hampshire Go Hog Wild. Well, as the authors themselves write, it is too late for that. The wild pig is a hybrid animal, a result of cross-building of various strains of pigs including the original swine introduced by early European settlers and Eurasian wild boar introduced by hunting clubs. This wild hog is not native to North American. Now it is considered the most invasive and destructive large mammal on the continent, it is an ecological disaster, according to the Fish and Game article. New Hampshire has a confirmed wild pig or feral swine population that is concentrated in Grafton, Sullivan, and Cheshire Counties. Ummm, that is where Corbin Park is located. I was surprised that the Wildlife Journal article did not call out Corbin Park for some (all?) culpability for the hog problem here. I assume that Corbin Park still has a large breeding population of wild boar along with other animals.Other strains of wild pigs are making their way year-by-year toward New England from southern states. 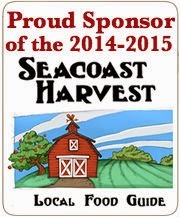 Soon the southern feral pigs may meet the wild hogs of New Hampshire. Wild pigs cause enormous damage and you can't shoo the hog back into a 24,000-acre park. Maybe the boar shouldn't be in the park to begin with. Reminds me of a classic case of private benefit at a public cost. You might say that those with access have gone hog wild. I was really beginning to worry on Tuesday. 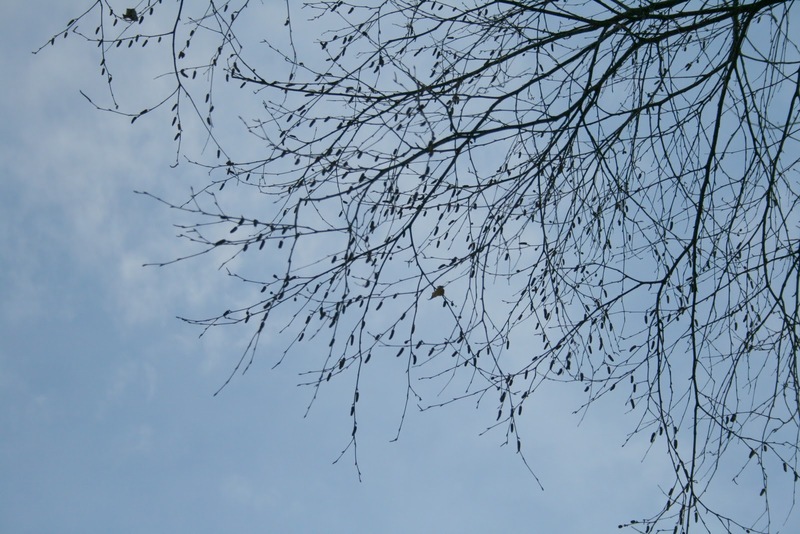 After-all, it was December 6th and the afternoon temperature was above 60 F in New Hampshire and I heard a mini chorus of spring peepers in the backyard. It was one of those days, after a relatively mild start to December (following a mild November) when you wonder if climate disruption is going to happen all at once. Well not to worry (save climate worries for another day), the forecast looks more December-like through the weekend. The wind is blowing hard today, feeling just like a December wind should feel. The birds are flocking to the feeders, even the goldfinches have finally arrived. The squirrels, well they just keep getting fatter. I noticed that one figured out how to get onto the sunflower seed feeder. I wondered why the seeds were disappearing so fast. The squirrel manages to sneak up there when I am not looking so I still don't know how she does it. Eric Orff, a retired New Hampshire Fish and Game biologist, keeps tabs on wildlife and nature over at his blog, New Hampshire Nature Notes. On December 1st he posted a note that the warm weather has kept ducks up in Canada - no need to migrate south if you still have open lakes and ponds up north to swim around in. Skunks and bears are usually sleeping in their winter dens by now, but Eric says they are still up and alert and perhaps spraying a curious dog (the skunk) or munching on a bird feeder (the bear). The weekend looks to be cold and clear. Sounds perfect. On Sunday afternoon we were walking in College Woods in Durham (a favorite local haunt) with our friend Ann and her two dogs Quercus and Persica. Kodi was thrilled to be running with these two canine friends. At one point Kodi started eating grass and other herbaceous vegetation. At first we did not notice, being distracted by an incredibly handsome and soft 14-week old male Siberian husky puppy that was out for a walk with his owner. After we pulled ourselves away from Koda the husky we called Kodi away from his foraging. Immediately he slunk off into the woods to vomit. He came out happier with tail up but kept licking his lips and every 100 yards or so showed signs of discomfort. We assumed he ate something not suitable for dogs. On the way home he moaned and thrashed a bit in his crate, very unlike him, but he showed no serious signs of distress. After we got home we noticed a bunch of burs stuck in his fur. One batch we had to cut out with scissors, so tangled they were. 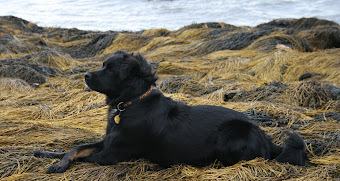 We soon realized that he must have licked off and swallowed other burs stuck to his fur. Burdock burs with their hooked bristles can irritate mucous membranes inside the mouth and throat. For the next 24 hours all he wanted to do was eat grass, something that he does not normally do. We assume it was to help himself vomit. Vets seem uncertain why dogs eat grass, but in this case there seemed to be a clear cause and effect. Kodi was eating grass to relieve some measure of pain in his mouth or digestive system. His stomach gurgled a bit and he was restless. Kodi looked sad for a day, but today he is completely back to normal and has weaned himself off grass. Now, if he can only avoid those pesky burs. 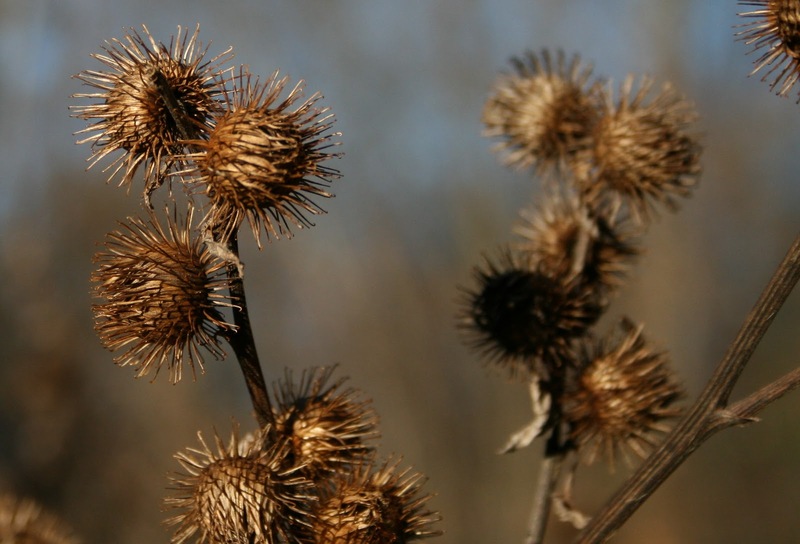 An interesting note about burdock burs -- besides the fact that they have an incredibly effective dispersal mechanism by latching onto animals for a free ride -- is that they spawned the idea for Velcro. A Swiss inventor was supposedly walking with his dog when he looked closer at the burs stuck to his clothes and his dog's fur. So now I'm hoping that Kodi leads me to the next big invention. Perhaps you've noticed all the gray squirrels. They seem to be everywhere, nearly one per tree. And they are fat, almost woodchuck-like in their girth. One often puts on weight when there is a readily accessible smorgasbord of food. Squirrels have had such an abundance this year, especially with the huge acorn crop last fall. The acorns kept them well fed through the winter and this year brought a healthy crop of seeds and berries. Six chunky gray squirrels visit our bird feeders daily, hanging around the base scooping up seeds tossed out by the chickadees, nuthatches, and titmice. Little do the squirrels know that the coming year will require austerity measures. There is no acorn crop. A recent article in the New York Times noted that in an average year oak trees produce 25 to 30 pounds of acorns. Last year some oaks produced 250 pounds per tree; this year, barely one-half pound. Usually fallen acorns feel like marbles under foot when we walk down Bald Hill Road. This year you have to scratch around in the leaves to find an acorn. This does not bode well for the squirrels. But this is the way of nature. Acorn crops fluctuate from year to year as do squirrel, chipmunk, and mice populations that feed on the nuts. Hawks and owls and foxes that feed on the small mammals will be affected in turn. So acorns are down, but look around for other animal foods. 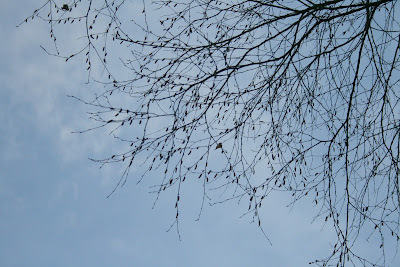 Check out the birches - they are loaded with catkins this fall. The seeds of birches are great winter foods for our small songbirds, such as chickadees and nuthatches. Ruffed grouse also seek out birch catkins. Birch seeds are not a favorite food of squirrels, but once the austerity diet kicks in this winter and next spring and summer they might take what they can get. Now that most leaves have dropped from the deciduous trees -- the oaks, beeches, basswoods, birches, maples, hickories, and all the understory shrubs -- you can see deep into the forest and you can see tree trunks clearly. The various textures and colors of bark stand out, especially when lit by a late afternoon sun. Look around at the various tree trunks. Better yet, get up close and feel the textures, although avoid hugging the ones oozing sticky sap. You will notice that tree trunks are more diverse than you thought. Bark textures include smooth, rough, scaly, shaggy, flaky, ridged, furrowed, or plated, among others. Some trees have thin bark others have thick bark. Why so much diversity in tree bark? And did you know that trees carry on photosynthesis in their bark? 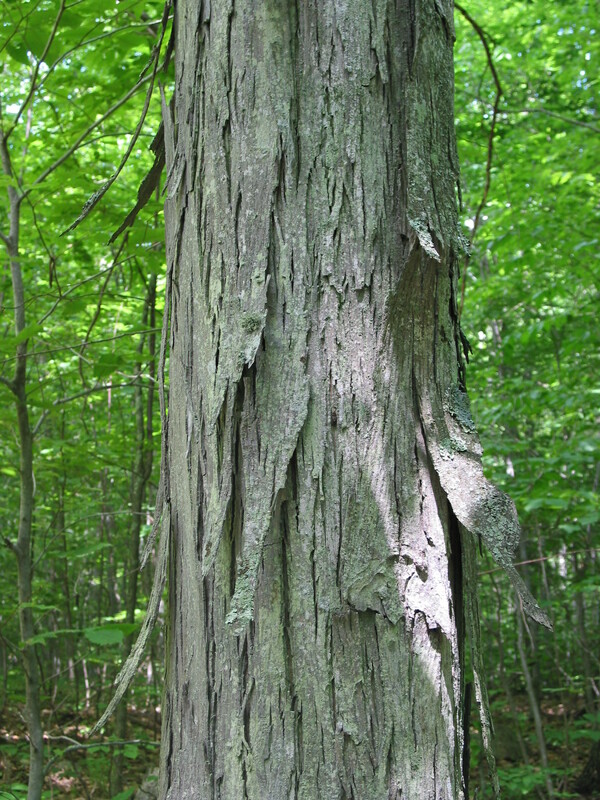 Michael Wojtech writes about bark in an article titled Getting to Know Bark in the latest issue of Northern Woodlands, a terrific magazine for anyone interested in plants, wildlife, woods, land stewardship, forestry, and so many other related topics. Michael points out the wonderful complexity of tree bark - or as he calls it "the multi-layered shell of a tree that can be detached from the wood." This layered shell includes a cork, cork cambium and cork skin which together are called the periderm, the outer part of the shell. The active phloem is next, the layer that transports food to all parts of the tree. The last layer before the wood is the vascular cambium, where cells divide and grow and produce the next ring of wood. So back to photosynthesis. Michael notes that it occurs in the thin green cork skin, especially on new growth where sunlight can more easily penetrate the thin outer bark. Once the outer bark or cork layer gets too thick, photosynthesis ceases, except on new shoots and of course in the leaves. Scrape the outer bark of a sapling and you'll see the green cork skin. Trees have different bark for specific reasons. 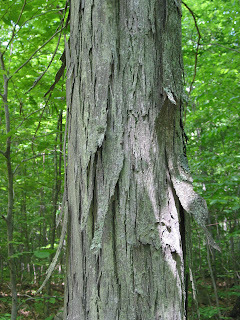 The American beech has smooth, gray bark (unless damaged by beech bark disease), an adaptation that evolved in the tropics where beech originated. The smooth bark prevents epiphytic plants (lichens and mosses that grow on trees) which are common in the tropics from getting a foothold. Epiphytes in mass can weigh down and break or topple a tree. 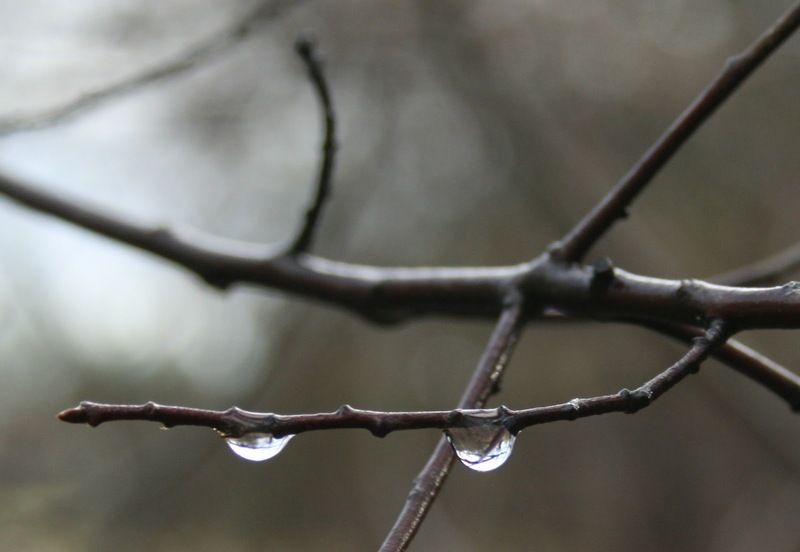 Here in the north where winter temperatures fluctuate between day and night, freezing and thawing can damage cells in the tree. A tree with dark bark would absorb the intense winter sun, warming the cells which are then chilled at night. This would cause the equivalent of frost heaves on our road, except in trees the cells would burst and cause long term damage. Two of the most northern hardwoods - paper birch and quaking aspen - have light bark. This allows these trees to radiate, rather than absorb, the intense winter sunlight, preventing the freeze-thaw cycle. Other hardwoods that live in the north such as oaks have darker bark with ridges and furrows that help radiate heat soaked up by the winter sun, much like the fins of a radiator. Softwoods of the north such as balsam fir and red spruce have dark bark, but they retain their needles year round which shades the bark. The resin in some tree bark helps repel insects. There are many more adaptations for trees to have different types of bark. Go out and get to know the tree bark in your neighborhood and think about why it is thick or thin, rough or smooth.